Some OS X apps are so great and so universally useful that they earn the title of “must-have” on just about any Mac, and we’re bringing you an essential list of these must-have apps that also happen to be completely free. Whether you have a brand new Mac that needs some new apps and utilities to get it going, or you just want to expand your app collection to get more done and have some great new tools at your disposal, don’t miss this collection of some of the best free Mac apps out there. We’re covering eleven essential apps here, but don’t forget to add your own must-have recommendations to the comments! Evernote syncs notes and rich text documents to other Macs, iPhones, PC’s, iPads, and just about anything else, letting you keep crucial documents and data with you everywhere you go. This is perfect for managing notes and to-do lists, and it also functions wonderfully as a cross-platform clipboard that is accessible from anywhere. 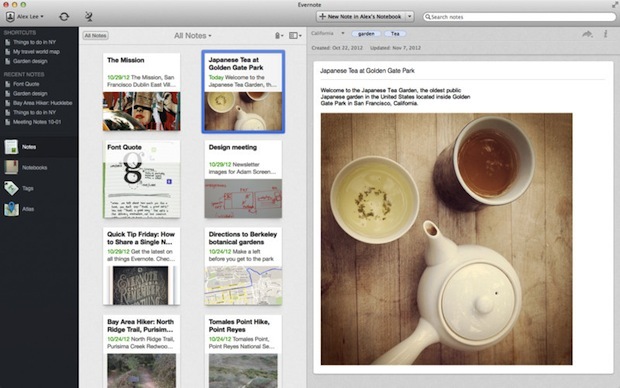 Evernote is quite simply one of the most useful Mac apps to exist and it’s pretty remarkable that it’s free. If you have an iPhone, iPad, or Android device too, don’t forget to get the mobile version of the app as well so you can access all of your data on the go as well. TextWrangler is a very powerful and well featured app for editing plain text files. It can open just about anything you throw at it, from simple TXT documents to SQL dumps and virtually any source code you can fathom. 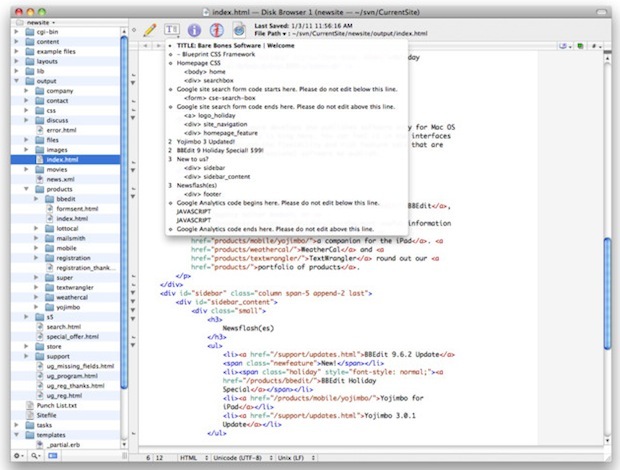 Whether you’re a developer, web designer, tinkerer, you’ll undoubtedly use TextWrangler constantly, and really the only thing better than TextWrangler is it’s older brother app, BBedit. Don’t have a Mac without it. Chrome is simply the best web browser for OS X, and any other platform for that matter. Sure, Safari is very fast, but once you open a handful of tabs Safari starts slowing down quick – you won’t experience that with Chrome. Chrome is fast, memory efficient, has simple Click-To-Plugin support, includes a built-in sandboxed Flash plugin (meaning if Flash crashes, your browser won’t go down with it), it syncs with Chrome on other devices, and it has a gigantic third party plug-in library to add even more features to it. Flux automatically changes the computer display coloring to warmer tones as evening and nighttime approaches, the image shown attempts to approximate this but it’s really best experienced first hand. The result can be dramatically reduced eye strain and, beyond that, it just makes looking at a screen much more pleasant in the evenings. Be sure to configure the tones to your individual lighting needs, and then give it a day or two to get used to the color differences, after a short period of getting accustomed to the tone changes, you’ll wonder you’ll wonder how you ever lived without Flux. Twitter is quite simply one of the best ways to get breaking news and information, and whether or not send out tweets yourself is largely irrelevant to it’s usefulness these days. The key to finding Twitter useful is in who and what you follow, so follow a few useful accounts (starting with @osxdaily of course) that correspond with your interests, and grab the official Twitter app for Mac, because even though it hasn’t been updated in a while, it’s still the best Twitter client out there. * Unfortunately, Macs with Retina displays won’t enjoy the official Twitter app much, because for some reason Twitter hasn’t updated the app for retina displays. Unarchiver will open and extract virtually any archive format you can imagine or come across. Zip, rar, gzip, tar, bz2, exe, sit, 7zip, you name it, it’ll open it. With Unarchiver installed, you’ll never download something and be unable to decompress it again, making it quite simply one of the most useful little apps that you can have installed on any Mac. 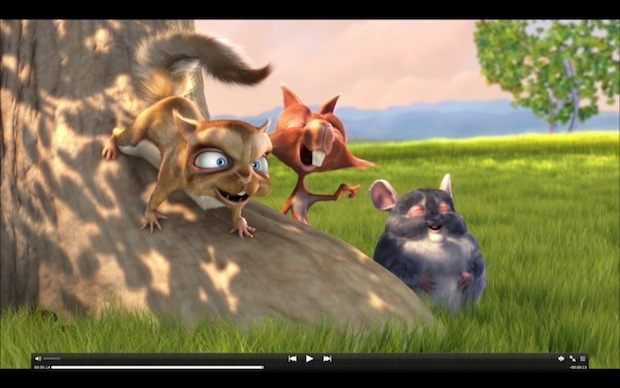 MPlayerX is a well made jack-of-all video players for OS X, able to play just about every conceivable movie, video, audio, or streaming media format you throw at it. It’s also full featured, and you can tweak colors and brightness of videos, adjust equalizers, play full screen on multiple monitors, and so much more. If you spend any time watching, downloading, or streaming video or movies on a Mac, don’t bother looking elsewhere, just get MPlayerX. Caffeine is a teeny tiny menu bar utility that performs a simple task when clicked; prevent system sleep, prevent the screen dimming, and prevent screen savers from activating. Because of how important it is to password protect and lock a Mac screen when it’s not in use, Caffeine is an essential app that lets you selectively avoid sleep and dimming when you want to, without doing anything other than clicking the coffee cup icon in the menu bar. At it’s core, Cyberduck is an FTP/SFTP app, but it can also connect to Amazon S3 buckets, WebDAV, and Google Drive, making it an excellent app for transferring files to remote servers of any type. Sure, OS X includes a simple built-in FTP client, but CyberDuck supports bookmarking, has as download manager, and is simply better. Cyberduck is $23 on the App Store, but guess what? You can still download it for free from the developers website. It’s a great app, don’t miss it. Skype is a VOIP (Voice Over IP) client that lets you make phone calls and video calls from your Mac, and other than being widely used across the tech world, it’s invaluable for when your smartphone battery dies or you misplace your iPhone. It’s always free to call other Skype users, and using it to call any phone number – whether local or long distance – is generally much cheaper than any cell phone plan you can find. Skype has been around forever but that doesn’t diminish it’s usefulness a single bit, grab it and sign up for an account if you don’t have one yet, it’s too useful not to. OmniDiskSweeper makes it incredibly simple to find out what is taking up disk space on your Mac so you can then either back it up or trash it, thereby recovering storage space on your hard drive. It’s simple to use and fast, and it should be considered a must-have utility for all Mac users. Did we miss anything? 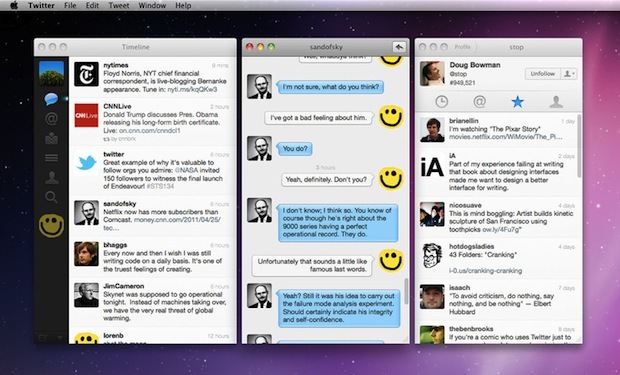 Is there any great free OS X app that you think every Mac owner should have on their Mac too? Let us know in the comments! I couldn’t figure out the Tweetbot interface, it’s over designed and for $20 I just don’t understand the purpose when Twitter and TweetDeck are free. Or the web. For me though, I use the iPad app mostly. Not free but a good deal compared to Tweetbot. TweetBot is $20 because Twitter is stingy and stupid with its API for desktop apps. However, it is FAR superior to the official Twitter app. I like being able to mute people or keywords, and having my newsfeed spot sync between my iMac, iPad, and iPhone is really nice; I can check twitter while waiting for someone, and when I get back to my computer I don’t have to scroll thru the same tweets. I’d have to go with Tweetbot too, I’m a regular Twitter user for business reasons and have tried a few free and paid apps. The £13.99 price is reasonable for what you get, we seem to have developed into a 69p/free app world, software used to have some value. The main feature for me is iCloud sync between my Mac and iOS devices. Tweetbot is definitely the best Twitter client on all iOS and OSX platforms. I can’t understand how people are saying they can’t figure out the interface, it’s simply gorgeous. And the rating it gets in the app stores proves that. Yes, it’s because of the scrooges at Twitter with its restrictions on API that it costs $20. MPlayerX is a good media player but the true Swiss Army knife is VLC, it will play just about anything. Another app that I just can’t live without, is TotalFinder http://totalfinder.binaryage.com/ One finder window with tabs, no more cluttering of finder windows. 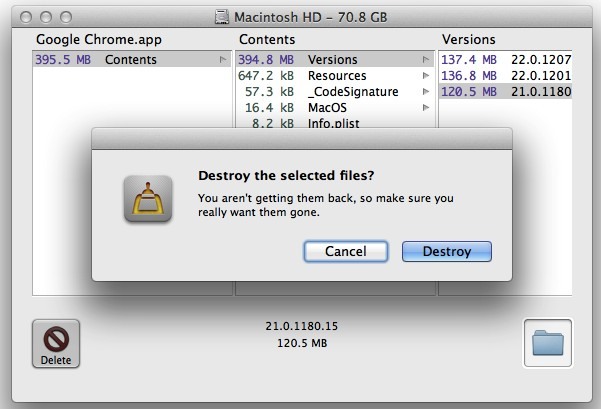 I can’t use the Finder without having this. Smartconverter from the Mac AppStore, converts video & audio files simply and quickly. Not bulletproof yet, but just easy to use. Definitely agreed with both VLC and TotalFinder about being a necessity. The only thing about TotalFinder is it doesn’t fit in this group because it’s not a free application. I would say another application would be Mactracker. It is very useful to find out details and specifications of every Apple device and operating system. MPlayer OSX Extended has a better subtitle support than MPlayerX. R & RStudio are of course must-have apps if you handle data or visualize things. Plex is perfect for watching TV shows and movies. It is pretty much automatic and intuitive. Just point it to where your TV shows and Movies are located and it does the rest, indexing with metadata. Plus it supports Roku so I can stream to my TV without converting any files whether mp4, avi, or matroska. It also supports accelerated H264 playback. Transmit is not free… They have only limited trial version. 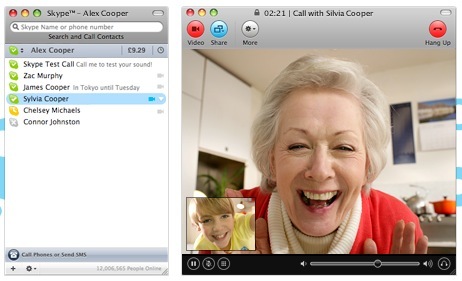 Skype’s latest version no longer works on Mac OS X 10.8.2; it crashes immediately on startup. Some research claims that SIMBL is the culprit, but I don;t want to uninstall it because I need it for colour icons on my sidebar. I highly recommend Alfred. It has saved me tons of time in searching for anything. I key in cmd-space, and it’s window appears. As I type in what I’m looking for, it intelligently thinks ahead and is usually right. For example, if I enter just “t” and hit return, it opens my Twitter account. It will do the same for any application or document on your drive. Could live without it but might not want to!! I’m a huge Alfred fan too! Cyberduck used to be a good program until the Intel versions. These days, it’s slow to start downloading, lots of spinning beach balls and it’s not very robust. The PowerPC versions are still very good on my older machines. I’ve since switched to FileZilla which can handle several multi-gig downloads and uploads without a hitch. The only drawback is that it’s a bit clunky and you can’t drag files directly to your desktop like Cyberduck, you have to download the files to a designated folder first. Only run this if you want your machine to run slow. Read the man page for “purge” and then tell me why you think it’s a good idea. Memory cleaner flushes inactive memory to make it free whereupon the poor OS that has cached files in otherwise unused memory has to read them off the disk again. Inactive memory is memory that isn’t presently needed for anything so it’s being put to good use to speed the system up. I have a dramatic benchmark (adapted from Linux) that shows exactly how much inactive memory can speed things up. We’re talking about the difference between about 45s and 45ms here — a factor of 1000 faster. Of course, if you want to give your disk some exercise and keep your computer warm, run MemoryCleaner. And, finally, as yourself if this is such a great idea why the OS bothers with inactive memory at all. I use purge and memory cleaner, but only when I decide to close down most of what I am running and switch to a new app that takes up lots of ram. This seems to be the best time to purge and free up loose ram, but as jch points out, just running purge when your low on ram and leaving all your apps up is going to leave you frustrated. I’ve done that (before I taught myself what was really going on when I purged) and frustrating barely describes what happens when you purge the wrong way. Have you actually measured the difference between purge and non-purge for starting up such an app? What if you use sync instead of purge? The time taken to retrieve a (memory) page from the free list compared to retrieving it from the inactive list should be immeasurably small. You’re missing the application Bodega obviously. I haven’t used OmniDisk Sweeper, but Disk Inventory X is quite good. Where’s Alfred? I couldn’t live without that handy app. MOST important mac app for me. BetterTouchTool hands down, combined with magicmouse gestures, this thing is a power user’s dream come true. Thanks for that useful tip. Just wondering, can I, for example, control a MacMini in one room which is streaming video content over AirPlay to a TV in another room, and control that MacMini using BTT as a ‘remote control’ ? I’ve tried this with other programs like Remote Mouse, Mobile Mouse, but not to any degree of success. You can use sublime absolutely free. And it is not goo, it is the best text editor ever. Flutter should also make it to this list! Safari is fast enough for me and doesn’t slow down. Do NOT use Chrome (or anything Google related) if you like to preserve your privacy. Have a look on “ownCloud”! If you have a home server install and try it! Have my own Synology NAS (DS213) which more or less can already give me this. Just curious as to what ‘plus alpha’ is there to gain from this solution. Totally free and all under your control. Your device to wherever you choose. I find Chrome too slow compared to Safari, both on my Mac and on iOS. So I don’t know what other people are on about saying Chrome is so fast and the best web browser, etc. lol Safari keeps everything in sync via iCloud anyway for me. I use regularly both browsers but with Chrome as a primary. With Safari i frequently have slowdowns on various kinds of web pages. I even tested friends JS online game that ran 9fps in Safari and 32fps in Chrome. And as for iCloud sync, I don’t even need to go there since I have it already synced through Chrome and I don’t find other iCloud features interesting. I use Firefox, I don’t have any slow downs… never liked the interfaces in Safari or Chrome. Privacy, bla, bla, bla… Who cares? But that doesn’t mean I think Chrome is the best browser. In my opinion Safari is the best browser. 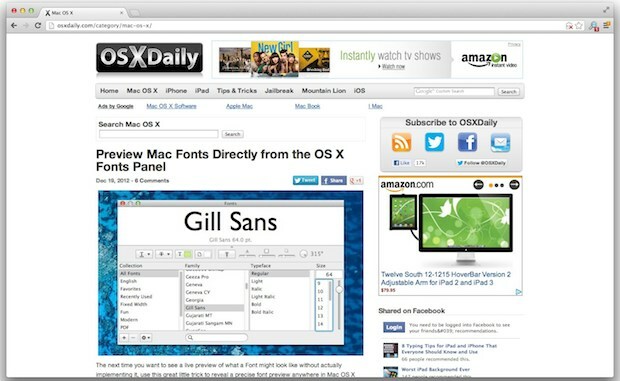 For Chrome to be the best browser it should be a real Mac app, which it just isn’t now. Why? 1) The close button is on the wrong side of the tabs! This is so annoying. This isn’t Windows. This is OS X and those close buttons have to be on the left side! 2) In English I think both OS X and Windows use the word File in the menu bar. In many other languages OS X and Windows use different translations. Chrome uses the Windows translation of File, instead of the Mac translation. Very annoying. 3) It has its own update system. I want to download Chrome from the Mac App Store, so the updates go through the Mac App Store. Ok, ofcourse Chrome is way better than Firefox, which is simply the worst Mac app I’ve ever seen. I wouldn’t even call Firefox a Mac app, but a very bad 1:1 port of the Windows version. – Available in the Mac App Store. – Close button on the correct side. – Correct translations which correspond with the translations of Apples own apps. That’s how software for OS X should be released. I always use Safari, but Chrome is also installed on my Mac, but only because of the build-in Flash Player. I don’t want to use any plug-ins, so I always use Safari without any plug-ins. I use Chrome when I really need Flash. The build-in Flash Player is only available to Chrome, so that way I don’t have to install that crappy Flash Player system-wide and I can just browse the internet without any plug-ins. BTW, Skype? We’re Mac users. We should use FaceTime. Anyone he has to work at the company on that Mac and has private customer data on it! I’m 30 years old and it’s just completely ridiculous how everyone is crying about their privacy these days. Do you really think an employee from Google recognizes you when he sees you somewhere, for example in a store. It’s not like that Google employee knows who are, where you live and which websites you’ve visited. People seem to forget Google collects data about many millions of people and this data is analyzed by their computer systems. Let Google collect data like my IP-address, operating system, web browser, visited websites and such data. Do I care? No. Why should I? Nowadays everyone keeps on complaining about privacy and they block advertisements and tracking cookies and what’s the result? Web developers earn less money, because the advertisements and tracking cookies are being blocked. Result: They start to use even more advertisement to get their money or they even start using pay walls. Those people complaining about privacy are destroying the internet. If this information is not using against you now, it does not mean that it will not be used against you in the future. So simple. There’s not much privacy left to preserve, but I’m not going to hand Google everything there is to know about me. I agree, Safari does exactly what I need it to do. Pocket never made the list :( I use this on all my iOS devices and my Mac, love how it keeps everything in sync too. “Chrome – The Best Web Browser for OS X” .. was that a joke? I actually thought the same when I read it, glad I wasn’t the only one. As a personal preference i would go with VLC over MPlayerX. When it comes to cleaning OmniDiskSweeper isn’t what i would have in mind, try CCleaner it does the job. Chrome isn’t the best Browser idk where you’ve got that from…Safari is still better. How come no one has mention: Vuze, Skydrive, VirtualBox??? It allows you to expand windows to fill the screen or portions of your screen. Also you can reprogram your trackpads swipe gestures and stuff. It’s pretty powerful if you’re into customization. As much as I love Chrome, on my Macbook Pro Retina, Chrome is a frustrating browser to use. It’s slow and nowhere near as smooth as Safari. If I force GPU rendering within Chrome, certain features stop working, such as gestures to move back and forth (on some sites, not all). Also not all websites seem to work with the GPU rendering as they still stutter. Safari isn’t perfect and has it’s share of bugs, but it still is a much nicer browser on the Macbook Pro Retina 15″ then Chrome. Nice list. Good adds. But, @Austria, Textmate isn’t free! I use Fluid for creating apps from websites, and Teleport for controlling my Macbook and iMac with only one mouse and keyboard. And finaly Boom for boosting up my music (sound). so what is this then? Plex is a must have for anyone with a large library of movies or tv shows. It’s perfect for organizing, and watching, and automatically adds metadata. I use it daily. I use it and hate it at the same time. The only thing Plex is good for is watching american tv shows and american movies. Letting the Plex media ‘manager’ loose on any other collection is a major headache. It’ll get garbled, tagged incorrectly and will be impossible to watch. If I want to watch any anime I have to flip back to VLC as Plex a) doesn’t tag it correctly and b) has poor subtitle and codec support. Guys, Please read the title, “11 Must-Have Free Apps ” can you see the word “FREE”? He is not taking about pay apps. Thanks for that. I reckon reader comments do get off track. That thought also crossed my mind but did not bother to mention about it. But, I did pick up on at least one other useful (but not free) utility… BTT (Better Touch Tool) that was mentioned more then once. I need to check that out to see if I can remotely control content streaming from my MacMini to my Apple TV without having to return to the MacMini’s trackpad each time to execute play, pause, etc. AppTrap is better — you don’t even need to run an app and drag&drop icons. My choice is http://www.menulet.me?mId=31 . But there is a lot of app with similar functionality – http://www.menulet.me/?filter=screenshot. just checked your suggestion, travmik. it’s quite speedy, but seriously lacking options compared to skitch. the main deal-breaker: no font choices. yes, do NOT get the new version. it’s really bewildering how evernote bought, and then ruined, this once great app and called it an update. One of my favorite apps is “Spectacle” which allow us to automatically arrange our windows in fullscreen/center/left or right side using a keyboard shortcuts inspirited by Windows. It triggers the discrete graphics on my MB pro creating unnessecary battery drain, heat and thus fan noise. I find Safari just that extra bit more polished, Mac-like and iOS friendly as well. But never the less a great list and a lot of great extra suggestions. uTorrent for torrents, VLC for video, Xee for image viewing, Reeder for RSS. VLC for playing any video file. Punto Switcher for Ctrl+Shift language switching. Beerware not freeware, but it’s close to free. Raise your hand if you’ve experienced beerware before. Pathfinder would be the key item of software for me. If I wasn’t able to replace the execrable Finder with something that is actually useful, I’d simply flatten OSX and install Windows or even use an abacus in preference. It should be called Loser, because unless you hack it via Terminal, you often have no idea where your files are on your computer, the most basic function of a file manager. Something Spotlight is equally guilty of. Trying to find out something as basic such as where a file is located via Spotlight is so very obscure and clumsy to do. And then you have to manually navigate to the folder it is located in. Gah! Finder seems like a clunky early 90s programme, albeit one that’s that’s then been crippled. You forgot Alfred 2 that is a very cool app.